One local Labor Day weekend tradition is the AJC Decatur Book Festival. 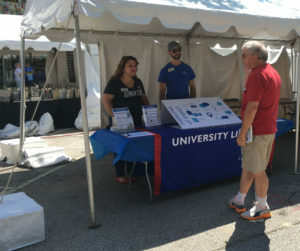 For the second year, the University Library hosted a booth to promote the Library’s resources to the community. Over the two-day event, Library faculty and staff engaged in conversations with nearly 600 attendees, including Georgia State alumni, current students, prospective students, community members, and out-of-town visitors. Library personnel shared about the work we do to support students and faculty, highlighted Fall 2017 events sponsored by the Library, and informed attendees about our Special Collections and Archives, Digital Collections, and other resources available to the community. One event we promoted was Thursday’s (9/7) opening of the Eastern Airlines exhibit. Over the course of the weekend, we spoke with a former Eastern ticket agent who learned of the airline’s closure over the news, a flight attendant who flew on an empty plane as it returned to Atlanta after its last passenger flight for Eastern, and a married couple who met as Eastern employees in Atlanta!